Discussion board allows the team members to communicate with each other with in a project. 1. To start your discussion, click on Add Discussion button. 2. Add discussion topic along with its description where the member can describe the discussion in detail. The creator can attach your files within a discussion and can be able to decide who can be able to view the discussion i.e. all members, internal members, external members only to specific members. The Title of the discussion should be added under "Discussion Topic". The discussion details will be added under its description. 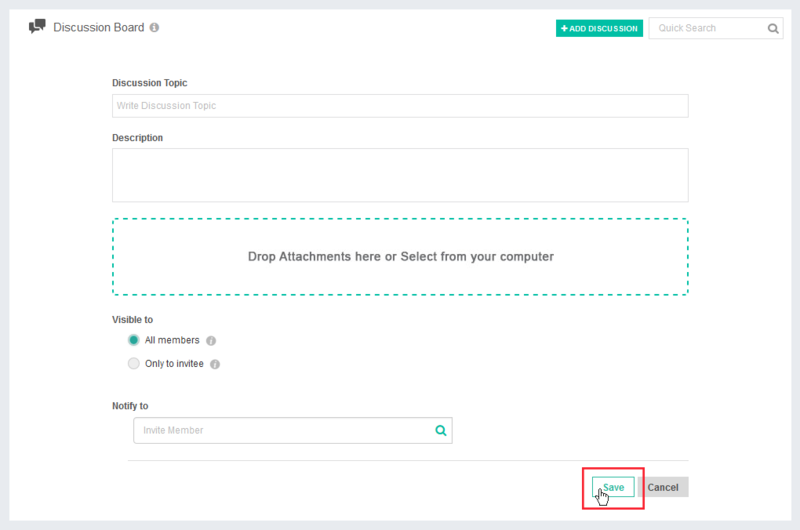 You can share your files within your discussion so the Team can be able to view it. You can customize your settings where you can decide who do you want do be a part of this discussion. You can customize your settings where you can decide who do you want to send the notification for this discussion.